Processed foods have a bad reputation and you've probably heard that it's bad to eat processed foods. Some of these foods deserve that bad rep, but not all of them. In fact, some processed foods are good for you. Processed foods have been altered from their natural state, either for safety reasons or because it makes them easier to store or easier to use. We usually think of processed foods as being bad. In truth, many of them are -- but some types of processed foods are good for you. The most common processing methods are canning, freezing, refrigeration, dehydration, and aseptic processing. It isn't really the method of processing that makes some processed foods so bad -- it's the ingredients used in those products. 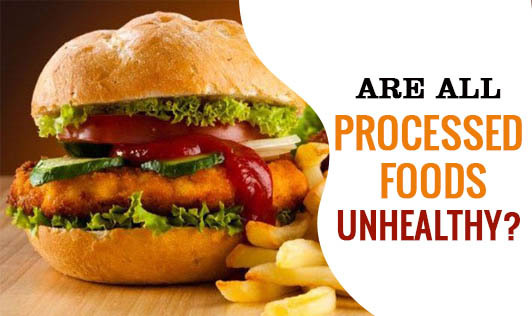 So processed foods made with healthful ingredients are fine for your diet -- just avoid those that are high in calories, sugar, fat, and sodium, or that have little nutritional value. Milk is processed food because it's pasteurized to kill bacteria and homogenized to keep fats from separating. Low- and non-fat milk are good for most people who can digest the lactose (milk sugar). Breakfast cereals are processed foods that can be good for you when they're made with 100-percent whole grain and fortified with additional nutrients. Unfortunately, many breakfast cereals are made with too much sugar, and they're low in fiber. Read the nutrition label on the package, it will help you decide if the breakfast cereal is good or not. Frozen foods are processed foods too. The best frozen foods are vegetables and fruits that don't contain any sauce, sugar or syrup. Freezing preserves most vitamins and minerals and makes the food convenient to store, cook and eat all year round. Fruit and vegetable juices are beneficial -- most of the time -- but look out for the brands with added sugars or that is high in sodium. Some juices, like certain brands of orange juice, are fortified with calcium, which makes them even better. Oatmeal, frozen fish and seafood (not fish stick or breaded varieties), canned salmon and tuna are healthful. Dried fruits, roasted nuts and seeds, and 100-percent whole grain bread are also examples of processed foods that are good for you. Processed foods made with trans fats and large amounts of sodium and sugar aren't good for you. They're low in vitamins and minerals and eating too much of them is bad for your waistline -- and your health. • Canned foods with large amounts of sodium or fat. • Pasta meals made with refined white flour instead of whole grains. • Packaged high-calorie snack foods such as chips and candies. • Frozen fish sticks and frozen dinners that are high in sodium. • Packaged cakes and cookies. • Boxed meal mixes that are high in fat and sodium.